In honor of National Teacher Appreciation Week, a new website is offering discounts to educators on everything from meals to clothing to electronics at more than 8,000 stores across the United States. TeachersPrice.com, launched today, offers discounts year-round for teachers, faculty and staff at local, national and online stores. The website was created by the same team that started TUN.com, a discount site for college students. 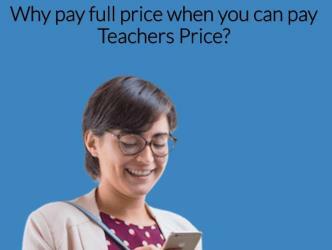 TeachersPrice.com offers discounts to educators. According to a recent study by the Organisation for Economic Co-operation and Development, U.S. elementary and high school teachers earn 33 percent and 29 percent less, respectively, than their college graduate peers. Also, teachers routinely reach into their own pockets to cover the cost of basic school supplies for their students. According to a recent study by the NPD Group, a New York-based market research firm, 91 percent of today’s teachers pay for school supplies with their own money. Other studies have found that a majority of education support professionals (administrators, bus drivers, custodians, lunchroom staff, secretaries, security guards, skilled trades people) also spend their own money to help students. Discounts at TeachersPrice.com include 10 percent to 60 percent off purchases at Best Buy, $20 to $200 off at Apple and $60 off at T-Mobile. The site also offers free online courses.